(Nanowerk News) Tobacco plants bloom when they are just a few months old – and then they die. Now, researchers have located a genetic switch which can keep the plants young for years and which permits unbounded growth. In short, an ideal source of biomass. The life of tobacco plants is short. They grow for around three to four months, followed by flowering and then die. Their size is also limited, with plants only growing to about one-and-a-half to two meters tall. Now, researchers at the Fraunhofer Institute for Molecular Biology and Applied Ecology IME in Münster have located the tobacco plant’s very own fountain of youth, which means they can keep it forever young. The Münster-based researchers discovered a genetic switch which can prevent the plants from change blooming to flowering. This also averts the plants’ early change demise to senescence – and suppresses the factor that halts growth. 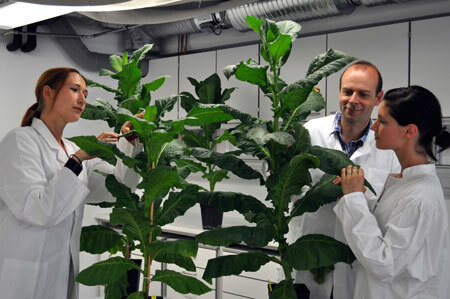 Dirk Prüfer in the greenhouse with colleagues Gundula Noll (right) and Lena Harig (left) along with their tobacco plants. “The first of our tobacco plants is now almost eight years old but it still just keeps on growing and growing,” says Professor Dirk Prüfer, head of the Department of Functional and Applied Genomics at the IME. “Although we regularly cut it, it’s six-and-a-half meters tall. If our greenhouse were a bit higher, it would probably be even bigger. Its stem is already ten centimeters in diameter.” Whereas in normal tobacco plants the leaves, which grow from the bottom of the stem, soon turn yellow and drop off, the IME plant’s leaves stay healthy and green. This is why the scientists have christened their modified plant species “forever young”. But what exactly do researchers do to give the plants eternal youth and make them capable of unbounded growth? “We modify the expression of a certain gene – or rather, the information contained within it – so that the plant’s flowering is delayed,” explains Prüfer. Researchers then insert the modified gene back into the plant using a bacterium. The role of the bacterium is to act as a sort of shuttle service for the modified gene. The principle is transferable and could be used on other kinds of plants; at the moment, the scientists are working also on potato plants on behalf of a Japanese chemical company. They use their knowledge to get crops to yield a far greater amount of biomass. In the case of potatoes, this means a great deal more starch. “If we want to guarantee security of supply for foodstuffs and plant-based raw materials, the yield per hectare will have to double by 2050, claims the German Bioeconomy Council. This new technology brings us a great deal nearer to that target,” reckons Prüfer. “However, our method is only likely to deliver success as long as the flowers of the plant in question play no significant role – sugar beet, for instance. It would make no sense to use the technique on rapeseed.” Preventing plants from flowering presents a significant advantage, in that no flowering means no production of seeds or pollen. As a result, plants have no way of reproducing, which means they cannot spread into the environment in an unplanned way. In the future, the researchers want to go further and be able to disable plants’ growth limits using chemical mutagenesis as well – that is to say, using normal growing techniques. This process involves using chemical additives to bring about changes in a seed’s DNA sequence. The advantage is that a plant grown in this way would no longer be genetically modified but simply a plant grown using standard techniques. “But in order to be able to do that, we first need to gain a better understanding of the deregulation of genes,” says Prüfer, who hopes cultivation experiments might begin next year. Then perhaps normal plants will be in a position to grow tall, too.